Following on from the Grammy® Award nominated success of INALA, Sisters Grimm is back with a colourful, upbeat dance musical with an important message about the environment and the Amazon rainforest. We speak to choreographer Helen Pickett about bringing the colour and energy of the Amazon to life through movement. Voices of the Amazon is set deep in the jungle, where a water spirit from the Amazon river, who ventures deep into the rainforest in search of a cure for her dying sister. Entranced by the beauty of the natural world, her eyes are soon opened to the realities of deforestation. It was this message of unity and caring for the earth that really spoke to Helen Pickett, who collaborated with Sisters Grimm team Pietra Mello-Pittman and Ella Spira to choreograph the new work. Helen has created over 30 ballets and is currently Resident Choreographer for Atlanta Ballet. Voices of Amazon, is a development on her style offering a chance for her to work with an established narrative. “Voices of the Amazon has that wonderful strong foundation of narrative. It’s such a beautiful anchor” Helen enthuses. The performance features a mix of duets and large group performances. The group dances were a chance for Helen to try something new. “I really went that way which was really fun” she laughs adding she really enjoyed creating movement where ‘everyone is united’. This theme of connection and communication runs throughout Voices of Amazon, which fuses ballet, contemporary and capoeira styles together to create a fun and energetic performance, celebrating the spirit of Brazil. Narrated by Jeremey Irons, the show is also supported by WWF and the Eden Project. WWF have provided scientific consultation as has Alexander (Xand) Van Tulleken. 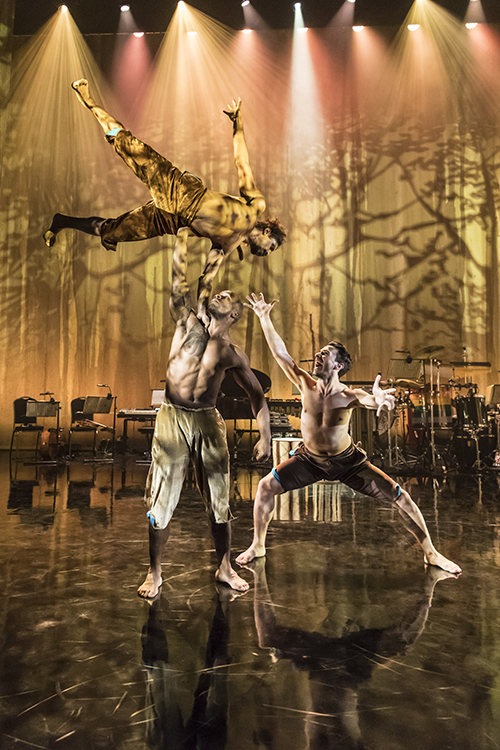 Voices of the Amazon is at Sadler’s Wells from 4-8 July and then at Latitude Festival on the 15 July.